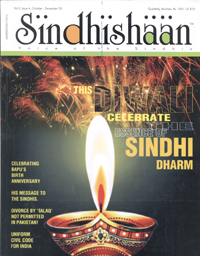 Read your latest issue – vol-II, issue-3, July-Sept ’03 (Sindhishaan). It is impressive and informative issue with wonderful cover. It is beautiful in get-up and content both, indeed! Your editorial truly sums up that we are the perfect balanced blend of humanity. Large hearted and broad minded like our community, and we have every reason to be proud of it, representing an ancient and rich heritage of over 7000 years old civilization. Please continue and keep up Sindhishaan!